Everyone needs a break once in a while, especially parents! Whether you want a date night out, time to run errands without having to worry about dragging kids in and out of the car, or just an extra set of hands for baby so you can spend some one-on-one time with your older child(ren) I am here to help. My work as a live-in nanny and babysitter for several families over the past decade has given me a broad range of experience in helping families adjust to their new "normal". I am comfortable and experienced looking after children from newborn to pre-teen and I am especially passionate about providing care to older siblings who may need extra attention and care while they adjust to their new role as a big sibling.. I have my First Aid, CPR-C, FoodSafe, and Child Passenger Safety Technician certifications as well as a clean criminal record and driver's record. Please note the price changes below as of January 1st, 2019. Please let me know if you have any concerns or questions about the changes! 4 hours of child care in your home. Child/baby minding for up to 3 children. Bed time routines done to your specifications. Clean kitchen & tidy house to come home to. Additional children are $10/each per day. 8 hours of child care in your home. 2-4 hours of child care in your home. ​Bed time routines done to your specifications. I like to meet with your family and children at least once before a date for care is made so that everyone will feel comfortable together and I can get a better idea of how I can help you best. I am first and foremost a birth doula. This requires me to be on-call for my clients 24/7. 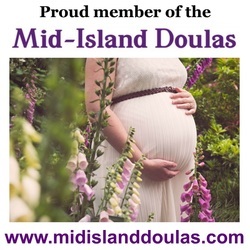 As such it is important to know that you may be required to return home or have a backup childcarer ready in the event I may need to attend to a doula client. These services are available to families living in the Cowichan Valley (Mill Bay to Ladysmith) on Vancouver Island.